Derick Brassard and Mats Zuccarello have built a ton of chemistry since last season, and have played well together this season. 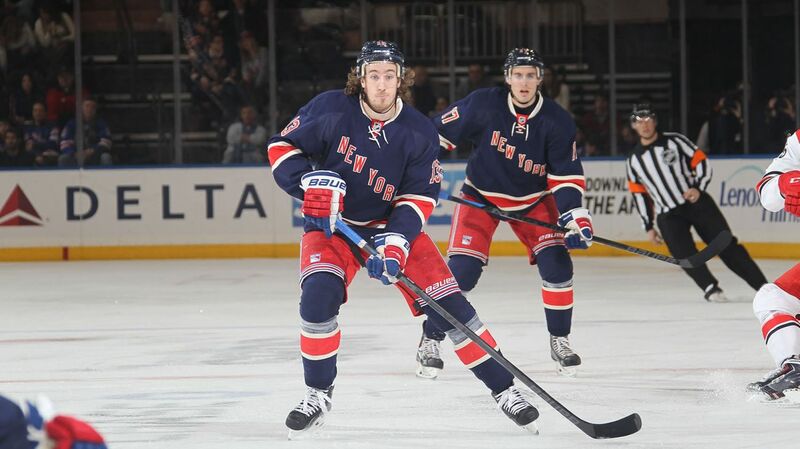 Alongside Rick Nash, they will get an opportunity on the Rangers top power play unit. Photo courtesy of Getty Images. Following the sloppy victory over the Maple Leafs last night, the Rangers practiced in Toronto ahead of their travel to Denver for their game against the Avalanche tomorrow at 9 PM. In that game, we saw a resurgent Mats Zuccarello, who extended his point streak to a career high six games, scoring two goals, including the game winner. While he has always been a great passer, and continued to rack up assists during his goal drought, Tuesday night saw him register five shots on goal, which is something that Vigneault and Zuccarello both knew needed to change. 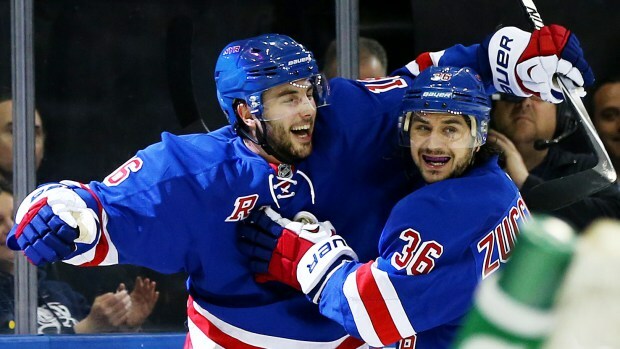 “I’m trying to (shoot more), but sometimes it’s hard when you see Nasher,” said Zuccarello. “He’s open. He’s got 30 goals, and I’ve got like five. The odds are better if he shoots it,” Zuccarello finished with a smile. While he was poking fun at his goal drought, Tuesday night was the happiest I had seen Zuccarello at in a long time. Zuccarello now has 10 goals on the season, along with 21 assists, which is not quite on pace for his 59 point that he hit last season, but is still pretty productive. He brings fantastic vision, passion, determination, and a solid skill set each night, and has developed great chemistry alongside Derick Brassard. Last night is the type of game that Zuccarello needed to regain some confidence, and prove to himself that he has the ability to score goals. AV also praised the play of Kevin Hayes, who has found some chemistry with Carl Hagelin on the third line. Hayes scored on Tuesday to extend his point streak to three games. The third line, with JT Miller alongside Hayes and Hagelin, was very effective, stringing together a few solid forechecking offensive chances and doing a good job on both ends of the ice. Kevin Hayes has been very effective in the last few games, and has developed nicely alongside Carl Hagelin on the third line. Photo courtesy of MSG Photos. With the power play in a rut, Vigneault changed up the units ahead of the game in Colorado. One thing that AV mentioned was the success of the top line consisting of Rick Nash, Derick Brassard, and Mats Zuccarello, a trio that totaled seven points in the game against the Maple Leafs. With Zuccarello a natural passer, and playing very well, Vigneault kept the three together for the top power play unit. “Mats has found his game and is playing extremely well right now, playing with a lot of poise and confidence with the puck, so I just felt that his five-on-five unit should stay together (on the power play),” Vigneault said when discussing the changes to the lineup. He also moved Ryan McDonagh to the first unit, and placed Dan Boyle and Martin St. Louis on the second unit. The Rangers power play was 0-2 against Toronto, but had scored at least once on the man advantage in three of the four previous games, going 3-10 in that stretch. New York currently sits at 10th in the league with a 19.6% efficiency rate. Vigneault also announced that Cam Talbot would be between the pipes for his fifth consecutive start. Talbot has gone 2-1-1 in his four games since taking over as starter, securing five out of eight possible points. He had a rough outing in Toronto, allowing four goals on 33 shots, and will look to rebound on a positive note against the Avalanche. Cam Talbot will start his fifth consecutive game for the Rangers, and will aim for a better showing than his game in Toronto on Tuesday night. Photo courtesy of MSG Photos. Posted on February 11, 2015, in Rangers Updates and tagged Alain Vigneault, Cam Talbot, Carl Hagelin, Chris Kreider, Colorado Avalanche, Dan Boyle, Dan Girardi, Derek Stepan, Derick Brassard, Dominic Moore, Henrik Lundqvist, James Reimer, Jesper Fast, John Moore, JT Miller, Kevin Hayes, Kevin Klein, King Henrik, Lee Stempniak, Mackenzie Skapski, Madison Square Garden, Marc Staal, Martin St. Louis, Mats Zuccarello, Matt Hunwick, MSG, MSL, New York Rangers, New York Rangers trade rumors, NHL, NHL 2014-2015 Season, NY Rangers, NYR, Phil Kessel, Rangers, Rangers Nation, Rangerstown, Rick Nash, Ryan McDonagh, Tanner Glass, The Ranger Zone, Toronto Maple LEafs. Bookmark the permalink. Leave a comment.